Liquids and broken down organic solids pass through the screen into the continuous aeration/mixing section (B). Air and mixing are provided by submersible pumps with a venturi system that receives air through intake pipes from the atmosphere. The PLC/HMI controls anoxic periods during the treatment cycle to enhance biological nutrient removal during a settlement period in compartments B and C. The system allows the operator the ease to make adjustments to fine tune this process. Mixed liquor is transferred by pumping to the clarifier section (C). The transfer cycle fills the clarifier with the excess liquid spilling back over the weirs into the main aeration/mixing compartment. 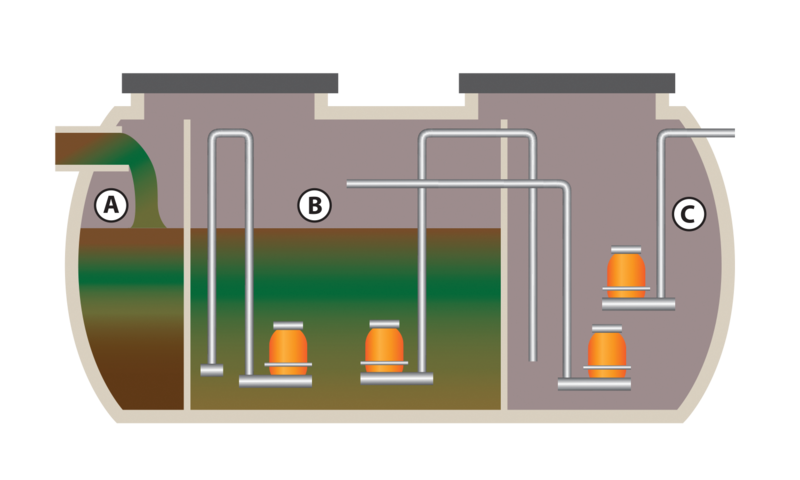 Transfer ceases, the clarifier (C) is now isolated, and solids separation occurs under quiescent conditions in C.
After settlement (nutrient removal cycle), the R.A.S. pump returns sludge to the head of the system from the bottom of the clarifier or to a sludge processing unit. Then after a second settlement, treated effluent is pumped out of clarifier (C) for discharge.